”Perm Medical Journal” (ISSN Key title: Permskiĭ medit︠s︡inskiĭ zhurnal) is a referred scientific and practical journal. It was founded in 1923 by Medical Society of Perm University. 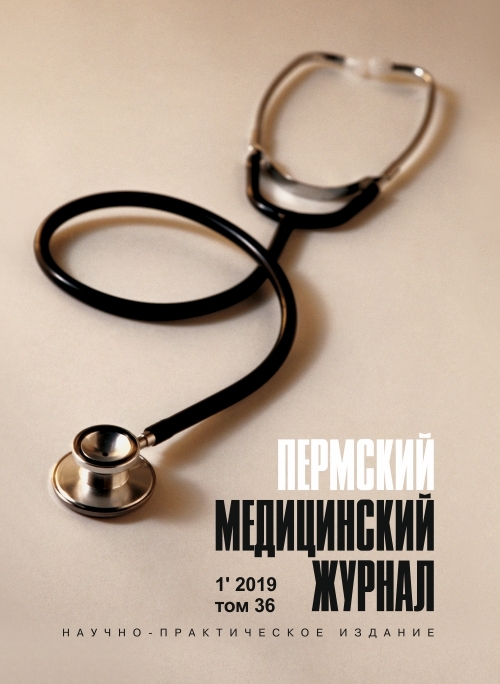 Since 2001 the founders of “Perm Medical Journal” are Perm State Academy of Medicine and Perm Research Center of Russian Academy of Medicl Sciences and Administration of Perm Region. Since 2017, the founder is Academician E.A. Vagner Perm State Medical University. The journal is registered by the Roskomnadzor agency (licensee ЭЛ № ФС 77-75489 on 05.04.2019). “Perm Medical Journal” is included into the list of the leading scientific journals and editions of the Russian Federation intended for publication of basic scientific results of theses for a degree of Doctor of Science. Phone: +7 (342) 221-73-45 (9.00 to 14.00, GMT + 5). Krochek I.V., Sergiyko S.V., Anchugova A.E. Amarantov D.G., Zarivchatsky M.F., Kholodar A.A., Nagaev A.S., Gudkov O.S. Akkuratova I.S., Spivak E.M., Manyakina O.M. Tokarev A.E., Kozyukov V.G., Schekolova N.B., Nenakhova Y.V. Shmyrova A.I., Pshenichnikova-Peleneva I.M., Kononova L.I., Korobov V.P. Illek Y.Y., Vyaznikova M.L., Leushina N.P., Mischenko I.Y., Ryseva L.L., Solovyova G.V., Tarasova E.Y., Suetina I.G., Khlebnikova N.V.
Kostareva R.A., Golovskoy B.V., Podyanova A.I., Gerasimova A.V. Nikolenko V.V., Feldblyum I.V., Vorobyova N.N., Nikolenko A.V., Sumlivaya O.N., Okishev M.A. Kochergina E.A., Trefilov R.N., Blyumberg N.V.
Permyakova A.V., Pospelova N.S., Deryusheva A.Y. Danilova M.A., Machulina N.A., Kamenskikh D.V. Sandakova E.A., Khlynova O.V., Zitta D.V., Stepina E.A., Koposova K.A., Okisheva L.G.